Over the last few years, the demand for berries and especially for blueberries by consumers has been increasing, which has led into an increase in this crop's cultivated area. Thanks to developments like the Hydropot System, also the outcome of the cultivated area increases - both in quantity and in the quality of the production. To improve the production of blueberry crops and to fulfil the growing demand, more and more blueberries are grown without soil, hydroponically. "Growing blueberries with a hydroponic system allows an increase of the cultivation density of plants, a greater rootedness and growth and a better control on factors of growth like water and nutrition", Maria Gimenez Lopez with Spanish company Hydroponic Systems explains. "It offers more control in the cleaning and hygiene and therefore you avoid problems of diseases of soil pathogens, as well as an increase of the production and of higher quality." In addition, it offers better control of the productive periods. "At Hydroponic Systems we always want to be close to farmers and producers offering solutions to achieve efficient control of drainage in hydroponic crops", Maria explains. Therefor one of the latest systems the company designed and manufactured especially for the cultivation of blueberries is the Hydropot System. 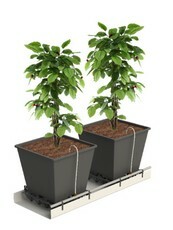 The Spacer Hydropot comes out of the need to improve the drainage conditions of the blueberry crop. 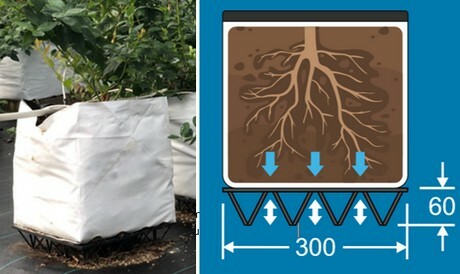 "It allows blueberry growers to obtain all the advantages of our system: the optimum aeration between the substrate and drains, the prevention of root exit from the substrate and its contact with drainage", Maria shows. "Thanks to the easy installation and disinfection and the efficient drainage circulation, the diseases decrease - offering eventually a production that's both higher in quality and quantity. The Hydropot System consists of a virgin polypropylene gutter (in black with additives for UV protection) and a Spacer Hydropot: a 30x30 cm piece allowing a perfect support of the pot / sack. "This system evolved from systems having the pot resting directly on the ground to using different supports (such as polystyrene or bricks) up until the current Spacer Hydropot", Maria explains. "Bricks or polystyrene do not allow aeration between the substrate and the drains and as a consequence the roots leave the substrate. In addition, due to its porous nature, fungi, bacteria and algae (potentially dangerous) proliferate. To avoid all these problems, the design of our Spacer Hydropot has been perfected." Thanks to the 6 cm height, the Spacer Hydropot ensures there is sufficient ventilation between the substrate and the drainage. The blueberry's roots remain inside the substrate, which prevents diseases proliferation and infections. Then there's the clips, which can hold the gutter, assembling the Spacer and hold the irrigation pipe if desired. It is possible to purchase the complete system or the Spacer Hydropot separately.